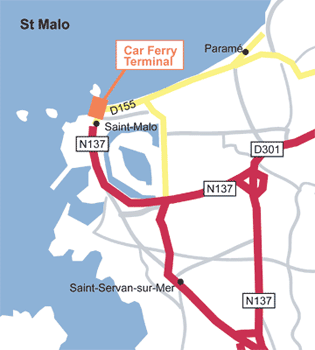 Book a Weymouth Ferry to the French port of St Malo. Book a Portsmouth Ferry to with Condor Ferries. The Quay, Weymouth, Dorset DT4 8DX. Weymouth is a great resort for all the family, with its safe bathing beach, picturesque harbour and a variety of attractions and events. Weymouth has much more to offer than just the beach. As one would expect of a coastal resort, water sports feature prominently in the list of activities. With excellent wind conditions all year round the waters of Weymouth Bay and Portland Harbour are a Mecca for windsurfers and dinghy sailors. Weymouth is 8 miles south of Dorchester on the A354. Follow the signs to Ferries/Ferry Port, which is on the left. Weymouth can also be approached from the A35 at Poole by following the A351, then the A352, & then finally the A353 into the Town Centre. 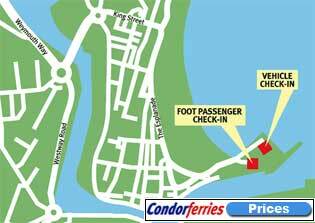 Book a St Malo Ferry ticket for your ferry crossing from the port Weymouth with the ferry operator Condor Ferries.